Despite what must have been a rough beginning, a stint as a Civil War soldier and the death of his young wife, Albert Dickerson managed to take advantage of every opportunity and made for himself a very successful life. He was on the forefront of the country’s westward expansion and took a leading role, politically as well as geographically. Albert Dickerson was born in 1835 in Tompkinsville, Kentucky, a small town just a few miles north of the Tennessee border. His father, Solomon Dickerson, was an aging Revolutionary War veteran, who served on the Maryland line as a private in the late 1770s. Solomon died when Albert was 7, but this couldn’t have been a great shock. Solomon was 89, a mere 51 years older than his widow, Sarah. We mentioned that Albert made the most of his opportunities. One of his first big moves was using an 1820 federal act (the Homestead Act would come in 1862) to claim a 143-acre parcel of land in Falls City in the untamed Nebraska Territory. The claim is dated April 2, 1860. In 1861 Albert married fellow Kentucky native Hannah “Eliza” Robinson. They had a son, and that’s when the Civil War came along. Albert volunteered in October 1862, enlisted as a corporal in Nebraska’s Second Cavalry, Company G, and completed his service in December 1863. During that period he was part of a regiment that battled with Indians in the Wyoming-Nebraska area, according to John W. Zink’s written account. “Family stories have it that he once saved an Indian boy from being killed by the soldiers, and raised the boy to adulthood,” John wrote. The Battle of White Stone Hill, charge of Sully’s brigade. Drawing from Harper’s Weekly, October 31, 1863, courtesy of Library of Congress. More details, courtesy of Jerry Zink: Apparently Albert’s cavalry unit was ordered to fight (basically, wipe out) an Indian village. After the skirmish a young Indian boy was found alive, and an officer ordered Albert to shoot him. Albert refused, and another solider was given the same order. At that point Albert went and shielded the Indian boy with his body. The boy, obviously scared, decided it was time to fight back, and he kicked and clawed at Albert, tearing his uniform and ripping off buttons. But Albert achieved his goal: The officer told Albert to take the boy and leave. Albert, and apparently Hannah, then raised the Indian boy, who, incidentally, doesn’t turn up in any official records or other family documents. True story or myth? You decide. Albert’s service ended a few months later, and he returned to Nebraska, where he and Eliza had several more offspring. But she died in 1874, leaving her husband with four living children. Albert didn’t waste a whole lot of time getting mad at the world. In 1876, two years after his first wife’s death, age 41, he married Anna Glick, who was half his age. But remember: Albert’s father was a half-century older than his mother. A two-decade gap must have seemed paltry. You can say this: They made it work. They stuck together for 46 years until his death in 1922. Anna’s Glick ancestors originally left Germany in the 1700s and were co-founders of the German Brethren faith in America. Anna Elizabeth Glick was born in 1856 in Ogle County, in northwestern Illinois. 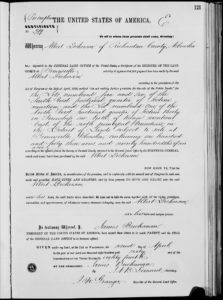 As a small child she moved with her family to southeastern Missouri, then sometime in the 1860s the family moved to Falls City, Richardson County, in far southeastern Nebraska. Anna was about to turn 20 when she married Albert. Records indicate the two were married in Monroe, Kentucky, Albert’s native state. Regardless, they lived in Nebraska. You need labor to run a farm, so Albert must have been thinking, “Why not have a few more kids?” Seven of Anna’s eight children survived infancy, including six boys. 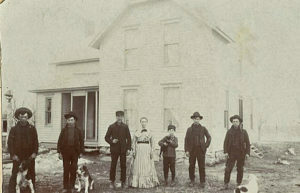 The family stayed in Falls City for a while, but sometime between spring 1884 and spring 1886 the Dickersons migrated to Sherman County, in central Nebraska almost due north of Kearney. “Mrs. Dickerson came to this county many years ago and was amongst the first settlers to establish their homes in this community,” read a line from Anna’s 1927 obituary in the Sherman County (Nebr.) Times. Albert claimed two 160-acre parcels under the Homestead Act near Litchfield, one in 1890 and one in 1896. The family ended up with several parcels in Litchfield along the Chicago Burlington & Quincy Railroad, which was built by the Union Pacific in 1886 and opened up the area for mass production. To help populate the area and create shipping business, the railroad offered package deals, which included land and moving expenses. The Dickersons’ several parcels of land can be seen on a 1920 map; they’re just northwest of the town of Litchfield, and straddle the railroad. Litchfield’s population was 240 in 1900, and rose to 403 by 1910. However, it never got much bigger. It seems timely to throw in a little Nebraska history here, because it undoubtedly had a huge effect on the Dickerson family. Nebraska Territory became the 37th state in 1867. 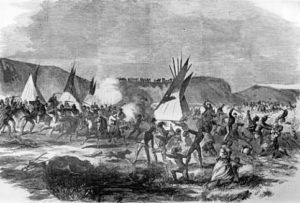 By the 1860s the U.S. government had pushed out many of the native tribes and opened the land to settlement by its citizens. The Homestead Act, under which a person could claim a 160-acre parcel by settling it for five years, was much-utilized in Nebraska. Also in 1867 the town of Lancaster was renamed Lincoln, after the recently assassinated president, and was made the state capital. Albert, a successful farmer and stockman, was not discouraged. He stayed on. New settlers came in waves in the 1880s, and many from Europe – notably Germans, Czechs, and others. Farmers blamed the railroads, banks and other business interests. Many joined the new Farmers’ Alliance organization, which opposed high freight costs imposed by the railroads and supported a plan for government ownership of the railroads. The Farmers’ Alliance created the Populist Party, which held the governor’s office from 1895 to 1901. 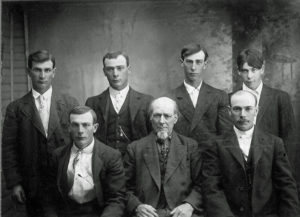 Albert Dickerson and his six sons, probably around 1920. (Ida, not pictured, was his only daughter with Anna who survived early childhood.) Top row: Charlie, George, Ernest, and Ed. Bottom row: Will, Albert, and John. He kept that seat for two terms. In 1894 a man named James Zink, also a Populist, took Albert’s spot in the 57th district. Albert, meanwhile, ran for Senate in 1894 as a Populist and barely lost. Albert was a gifted speaker, while James (Jim) was quieter, Howard Zink wrote. Albert reported that the only thing he ever heard Jim say in the legislative sessions was, “It’s time to tie up the horses for lunch,” when the time for lunch break was long past. Their political tie led to the marriage of their children. On March 20, 1901, Ida May Dickerson and John James Zink were married in Loup City, Sherman County, the record shows. The young couple stuck around central Nebraska until 1910, when John J. took the money he’d made from some shrewd land deals and headed to Animas City, Colorado, and made more shrewd land deals. Albert and Anna visited their daughter at least once in Animas City in 1910. It wasn’t a fun time to remember, as Anna was accidentally shot and nearly died. (See Anna Dickerson’s story for more details.) It’s possible Albert and Anna saw Waterfall Ranch after John and Ida bought it and moved in, but there’s no record of that. Several children of one of Ida’s brothers appear in an early 1920s photo at Waterfall Ranch. Albert died in Litchfield in 1922. He was 86. Bureau of Land Management land patent records. 1890 veterans schedules for Sherman County, Nebraska, part of 1890 Census report. Family history notes by John W. Zink, appears in John James Zink 2001 Family Reunion book. Interview with descendants of John W. and Ruby Zink: Ed Zink, Jerry Zink, Anne Zink Putnam, Heidi Zink, and Kristi Zink, and Patti Zink, Nov. 20, 2016. Assumed from birthplaces of Dickerson children. Sherman County (Nebraska) Times, October 21, 1927, accessed via findagrave.com. Courthouse Politics, Loup City, Sherman County, 1887-1891. Nebraska Blue Book, p. 336 and p. 383. Howard Zink, written for 2001 John James Zink Family Reunion book. John James Zink will often be referred to in this narrative as John J., to distinguish between him and his son, John Wilson Zink, who will be referred to as John W.